The Baltimore run game stood out consistently, as running backs Mark Thompson and De’Lance Turner each rushed for over five yards per carry in the contest. Lamar Jackson added 25 yards on the ground on three carries, including a touchdown run that came on a naked bootleg. Early in the third quarter, Thompson had the most impressive run of the night, as he ran to the right on an outside zone play, broke a tackle and cut back across the field for a 32-yard gain. Jackson and Josh Woodrum each threw the ball well overall. Jackson had a beautiful throw up the seam to Mark Andrews for a 45-yard gain as well as a handful of other nice throws inside and outside the pocket. Woodrum’s lone interception came on a ball that should have been caught by DeVier Posey before bouncing into the arms of Ranthony Texada. Patrick Ricard had a very solid all-around performance in tonight’s preseason finale. His impact was felt along the line of scrimmage in both the run and pass game. Ricard excelled tonight in shedding blocks and helped stall Washington’s run game into the fourth quarter. He also fit well with the numerous stunts Baltimore ran in the fourth quarter. Whether making a positive or negative impact on each given play, it seemed that linebacker Chris Board was always around the ball. He tied for the team lead in tackles on the night and was also targeted frequently in the passing game. Board struggled to truly find a groove, especially against Washington’s power run plays, and he also was beaten in short yardage passing situations. A roster hopeful, Board flashed some potential tonight that could be useful as a depth defender for the Ravens. The Washington defense had trouble getting off blocks and making plays in the run game. They missed a number of tackles and allowed the Baltimore running backs to gain plenty of yards after contact. The Redskins were only able to get one sack on the night and did a poor job of getting pressure on the Baltimore signal-callers. Part of it was the Ravens’ offensive line standing out in pass protection, but overall, there were few occasions where Redskins defenders showed the ability to get off blocks rushing the passer. Running back De’Veon Smith entered the game in the second half and provided a much-needed jolt into Washington’s offense. On top of 42 yards on just seven carries, he also had an impressive catch on a screen pass go for a 28-yard touchdown, making multiple defenders miss along the way. Kevin Hogan had a very up-and-down performance in his full game start with three touchdowns and two interceptions. In some instances, he showed a great ability to escape pressure in the pocket and make nice throws along the sideline on the run. However, Hogan also had multiple interceptions due to simply misreading the coverage downfield. Both of these interceptions came on short and intermediate routes. Washington: Washington’s turnovers proved to be the biggest key to this game. 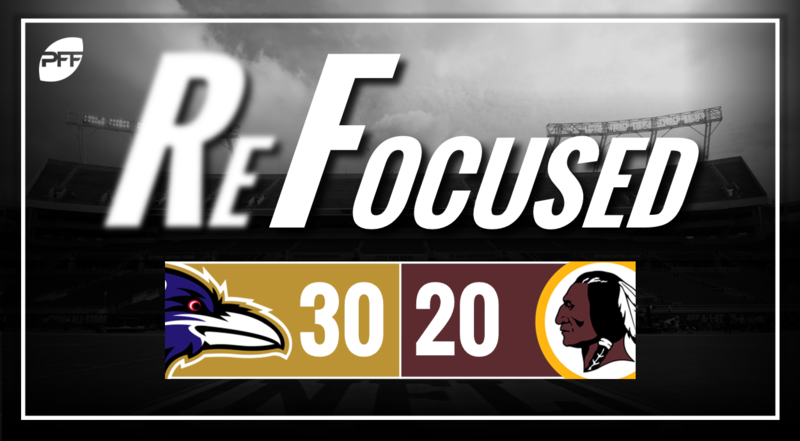 Ricard’s forced fumble and recovery of Samaje Perine combined with the two interceptions of Hogan took too much momentum away from the Redskins’ offense and gave Baltimore too many opportunities to build on their lead all through the game. Baltimore: The key to the game was the Ravens’ offensive balance. They were able to consistently do good things not only in the run game but in the pass game, as well.